Have questions about a program? Check out our Program pages to get in touch with the person you need. Or give us a call at 416-363-6441 or email info@foodshare.net and we’ll put you in touch with the right person. Visiting FoodShare? Click here to map your route. Head to our entrance right on Industry Street. From Runnymede Subway Station, take Bus 71B. The bus will drop you off in front of FoodShare at 120 Industry Street. From Eglinton West Subway Station, take Bus 32C to Trethewey/Todd Baylis Blvd and travel up to Industry Street. From Keele Subway Station, take Bus 89 to Ray Avenue. Travel towards Industry Street. Eglinton Ave W/Black Creek Drive OR Jane St/Eglinton Ave W are the nearest major intersections to us. Please see the map below to see how to get to 120 Industry Street. Ample street parking and other neighbourhood parking is available nearby. From Highway 401/400, take Black Creek Drive South. Turn right on Trethewey Drive. Turn left on Todd Baylis Boulevard. Then turn right onto Industry Street. 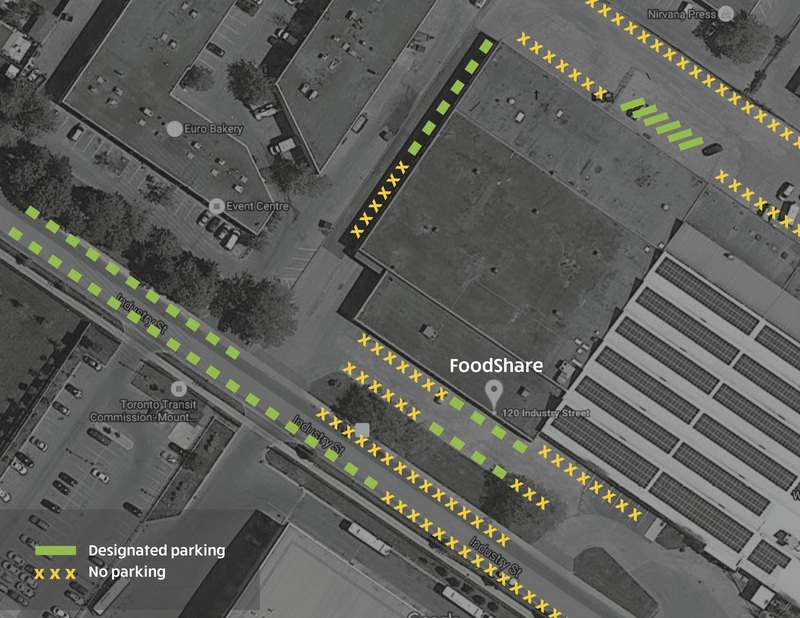 Parking: please see below map for parking details. Click here for a full staff list with contact information.